Emperor Nicholas II and Empress Alexandra of Russia present their baby daughter, Grand Duchess Olga to her great grandmother, Queen Victoria during their 1896 coronation visit to Balmoral. I discussed the history of royal baby names with Elizabeth Holmes at Vogue Magazine this month, including examples from the twelfth century to the present day. While “Victoria” is considered a royal name today, it was unusual in Britain during the future Queen Victoria’s childhood. 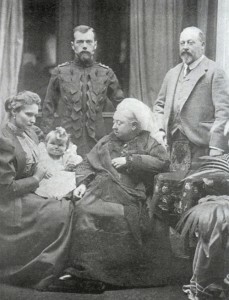 Victoria encouraged her own descendants to include “Victoria” or “Albert” as part of their children’s names. In contrast, Queen Elizabeth II appears to accept a wide variety of names among her grandchildren and great-grandchildren from the traditional (George and Charlotte) to the more unique (Princess Anne’s grandchildren Savannah and Isla). There is intense speculation concerning the name that William and Kate, the Duke and Duchess of Cambridge will choose for their third child in April with “Mary” “Alice” “Victoria” “Arthur” and “Philip” among the possibilities.